The Trolls are in trouble! 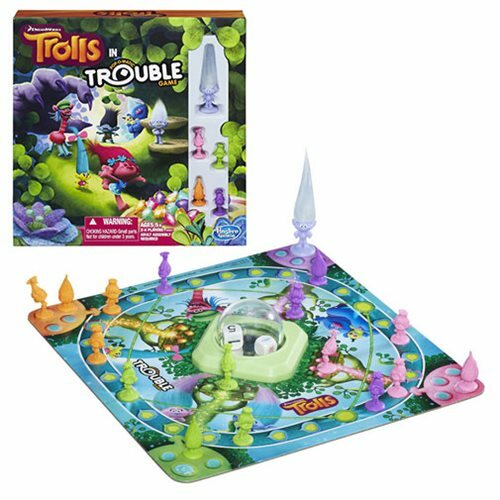 This DreamWorks Trolls edition of the Trouble game combines classic gameplay with Trolls tricks! The Bergens are on the move and they are in search of Trolls to eat for their annual feast. In the DreamWorks Trolls in Trouble game, players try to get their pawns safely home for the win, but the Bergens are always lurking and can "pop up" at any time. The first player to get their Troll pawns safely home wins! Getting in a jam has never been so much fun! The excitement begins as soon as kids press the Pop-O-Matic bubble to roll the dice. Then players race to get all their pawns around the board to the finish zone. And in this edition of the Trouble game, the DreamWorks Trolls can move from tree to tree on zip lines! There are 4 zip lines on the board, helping the game go faster. The player to get all 4 Trolls safely home wins! 2-4 players required. Ages 5 and up.